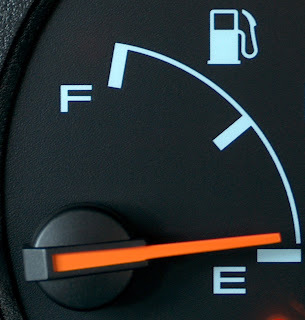 Are any of you running on empty? This morning (I'm writing this on Sunday), I found myself a wee bit...grumpy. My husband returned home from his business trip on Saturday afternoon (I feel strongly that business travel should be banned the last month of summer) and I just kept waiting. Waiting to be magically refilled? Waiting to waited on? Waiting to step into replenishment and out of this dry desert? Whatever I was waiting for didn't materialize, hence the grumpiness on Sunday morning. As I got ready for church, I thought about the possibility of receiving nourishment in that space, in that time with Jesus. And then I thought to myself, But church is a time to worship God, a time to give back to Him. It's not all about what I need. And then I thought, What if in my worship of Him, I find myself refilled? What if in the giving, I receive? What if the act of focusing on something other than my own feelings, breeds something that will soothe my soul? For when I worship the Author of my salvation, the Restorer of hope, the Giver of everlasting life and love, does He not shower me back with all of those things in that moment of offering? The song, I Will Give You All My Worship, began to play as I stood in that church pew and I was literally compelled to raise my hands. My smile spread bigger than my face could contain. And as I lavished love on Him, offering every single bit of myself, I felt filled with His love at the same time. Living into the fullness of what I was created to do -- there was fulfillment. The fulfillment that my heart longed for could not be satisfied with food. It wasn't in acts of service by my husband. It wasn't even a break from my kids. The fulfillment was simply found in the act of raising my hands, lifting my voice, and the offering of praise. Living in the fullfillment of what I am suppose to do! I love that Jen. You are so right. And God gives it to us if we are willing to receive it. God Bless this week! Back to school!!!! "What if the act of focusing on something other than my own feelings, breeds something that will soothe my soul?" I know this is true. When I look outside of myself, I find my soul soothed. This reads like poetry, my friend Jen. Empyting our self OF our self that we might be truly filled with all the fullness of God. Have you been watching my house lately? I just wrote about this grumpiness. This is a powerful post-what if in the moments of giving, I receive-something that I have been wrestling with and pondering in my head lately as I have been thinking about nourishment. So wonderful! "What if in the giving, I receive?" I love this. And I love how God does fill us, fills those places that have been emptied and poured out. I think these times are necessary, that in our emptying we become more desperate for our Maker...more aware of our frailty...desperate to worship and give back and find Him ...desperate for the only One who truly satifies. My soul does long for Him. Thanks for the beautiful post. It reminds me of the last bit of the prayer of St Francis that is so beautiful. I think you've stumbled upon a great truth. When I'm down and know I'm way too focused on myself, I get my hind end to the adult home or otherwise find a way to bless someone else. Works every time. Thank you, Jen, for your post and your community. Truly I think GOD has designed that truth has a hidden treasure...telling us to love Him with our all and love others...but in the obedience, we are surprised to discover how we are also blessed...as long as we obey without thought of self gain. LORD, please help us to bask in you...have you be our All in all and to love others with Your Love. What if in the giving I receive. How often that happens when we give to God. I've never out-given, out-worshiped or out-loved my God. In true worship, we do have to give up our needs and desires; to abandon it all to focus on Him. When we come with the right heart, he never ceases to fill us. He alone is worthy of our praise! This is exactly what I needed to read tonight. I am having a grumpy kind of evening. I know that it because I am tired, but it is no excuse. Thank you for the reminder that it is not all about me and that I need to worship Him for my true fulfillment. We were made to worship, that is why we find fulfillment when we surrender to self and give to our King. Only God can fill our longings. Beautiful! Oh, I know how this is -- in giving, we receive. Especially as we give praise and worship to the One who it is due. In fact, it happened to me today! What a great word, Jen. This is truly beautiful, Jen, and I think you are right - when we focus on Him and give what He deserves, He always blesses beyond measure, giving back more than we could ever give. He's cool like that, and I'm so thankful! Another beautiful and inspiring post, Jen. I love this, "What if in my worship of Him, I find myself refilled?" Hi Jen - I agree with you. On the days I feel so empty, I have to tell myself when going to church that I'm going to give - give worship no matter what and inevitably God refreshes. Great post and I love joining up with all you lovely ladies. How sweet of the Lord to meet you in your grumpiness. I have been praying on Sunday mornings as I settle in to church (purchased coffee at our church coffee shop) . . . Lord, I want to receive all that You have for me today. Jen, I'm sorry I entere twice--I kept getting an error and didn't realize it went through :). You can delete me :). The end of summer...oh, yes. We are crazy busy this week with school starting in the next couple days. My head is spinning. I need a pause with God. I think I'll take one right now. See how you inspire? Wowsers does this ever speak to me in my life right now. And I whole heartedly agree that business travel should be banned the last month of summer. Argh! Pray for me...that upon his return I'll remember this post and love him and God the way I should! Thank you Jen for SDG, I love coming here and reading from such lovely women in love with the Lord, it is so refreshing! Hi Jen. :-) I think to feel empty at times is natural for human beings. It is part of being human, and part of our need for God. It is only through Him that such space inside our hearts can be filled, not anything worldly that tend to be passing. Definitely running on empty, definitely in need of refreshment from the One who fills me up. Taking some time off from internet world to sit as His feet amidst the busy days to come. Blessings, Jen. so glad worship refreshed your soul. Actually I am running on full lately and am very thankful for this. Earlier in the year was very tough but now am in consolation as some call it. I have learned though when I am in a peaceful place to take the time to read, grow, pray and maybe explore to learn new things. In times of dryness, emptiness is the time I rely on my sure ways to restore my spirit and music is one of those. Great thoughts! I wouldn't call it magic, but the simple raising of our hands in worship is a release that brings us joy and peace. Lifting our hands to heaven is both a praise and an act of surrender. I enjoyed your post very much! Thank you for hosting this Blog Hop!!! hey friend. it's 8 pm and i'm just now getting to read comments, posts, etc. thank you so much for your comment today. must have been a Holy Spirit-inspired post because i seriously couldn't rest until i wrote. i love when that happens! have loved reading all of your posts of late, especially the one about Craig. i'm very thankful for him for you. I'm late to the party for a variety of reasons, not the least of which is that I have been feeling exactly the way you described. And just like you, fresh praise yesterday morning was exactly what the Great Physician ordered. I absolutely love that song.. it never ceases to give me goosebumps! Thank you for this Jen..we all feel empty sometimes. There's a giant hole in us that only He can fill. I'm linking up a bit late, but I also have a prayer request. Could you please pray for Nicholas and Joanna who are planning to end their marriage and telling the kids today. Thanks and God bless! Oh, Jen. You and I are on the same page. I love how you found the receiving in the giving, in the praise, even when you felt you were empty. That's beauty.